Designing for enterprise products can get complicated. The sheer scale and convoluted nature of the design process presents huge UX challenges. We recently hosted a webinar with Uday Gajendar, Principal Designer at Peel and previously of Oracle and Citrix, on how craft—the intentional, thoughtful design of processes and products—fits into the wicked complex design workflow for enterprise products. Everyone has their own definition of craft, but there are some common threads. The notion of craft is dependent on similar ideas of diligence, pride, beauty—it calls to mind the idea of carefully hand-shaping a raw material. So, what is craft in a digital medium, as it relates to designing apps, services, and products? 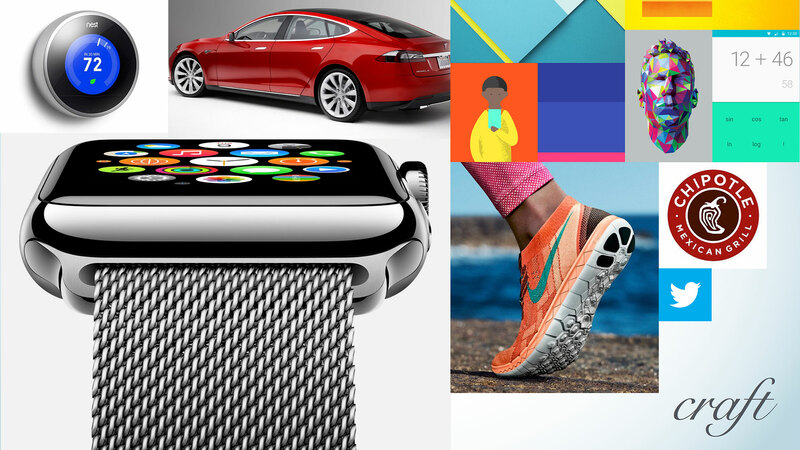 On one hand, there are highly-polished and finalized technological objects, like elegant wearables hanging off your wrists or electric sedans whizzing down the highway. But for the digital medium, we must move away from seeing craft as beautiful, final objects and toward the idea that craft is a facilitative anchor that enables productive teamwork and decisions. It’s not to say that beauty or precise care in design isn’t important. Let’s be clear: no one wants to buy or use something that’s malformed or confusing. A well-formed product instills confidence in the buyer. A well-formed product conveys a unified sense of trust, integrity, and quality that you can bank on. It’s simply that craft can go beyond that. Designing enterprise UX can take you down a difficult, frustrating path. The wickedness of craft in enterprise UX comes from dealing with opinionated, cynical stakeholders. Within the swirling mess of constraints and contingencies, it’s easy to lose sight of the focus to instill a sense of craft in what we make. Clarifying the goals and intents of the buyer (C-level) versus the user (admin) and try to reconcile the 2. Wrestling with the multifaceted relationships between the application’s objects, actions, parameters, and attributes. Both how they’re defined within the database and ultimately how they’re expressed in the UI as a cohesive UX. Navigating rough political currents just to fix an application. For example, handling a legacy technical framework where everyone has a specific agenda and priority. No single designer can resolve these issues on their own. It takes engagement with difficult folks. But designers are optimists. We know that by creating artifacts (be it a diagram, sitemap, or prototype), the tangible nature provides a center of gravity to draw competing perspectives together and create stakeholder alignment. It also helps gain trust and credibility, and that helps you as a designer to build influence within your company. These tangible artifacts become tools to help designers achieve alignment, promote discourse, and get everyone out of the energy-sapping “analysis paralysis” mode. Uday told 3 short stories about how he’s used craft as a facilitative anchor throughout his career. We’re going to recap the first. For the other 2, make sure to watch the recording above! When Uday was a junior designer in 2000 at Oracle, a GM challenged him to clean up a messy e-business web-based application. Wanting to do more than clean up the interface, he took a reactive approach. 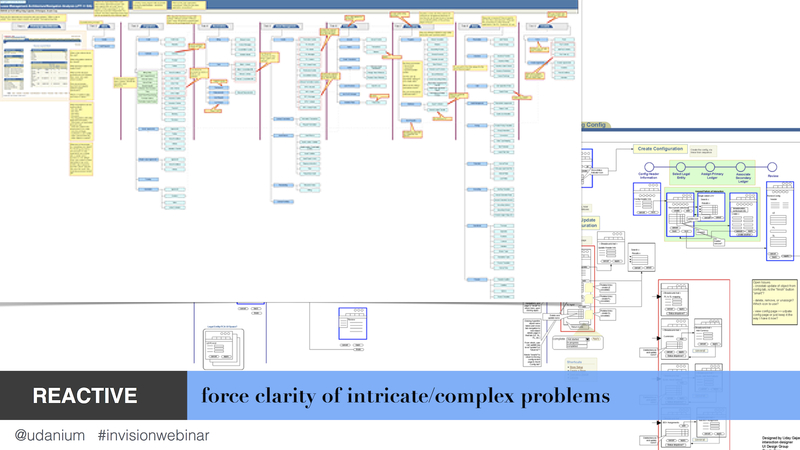 He mapped out the entire application UI architecture, using a massive annotated diagram. He identified key areas of improvement and suggested other areas that needed an update. Then, he printed it out—all 7 feet of paper—and took it to his GM. Faced with the monstrosity of the artifact, the GM realized that it wasn’t a small project of a few screens. Because he saw the artifact, the GM was able to take a broader, strategic view of the core problem. It wasn’t just cleaning up the interface, it was really trying to re-architect the content, functionality, and overall structure of the product. It forced him to improve resource allocation in the timeframe. It didn’t involve a few designers in a few weeks—it involved assigning a team and taking the entire quarter. Artifacts can force clarity of the complexities of the wicked problem space.